This article is about the short story. For the achievement, see Breaking Quarantine (achievement). Breaking Quarantine is a story in the Halo Graphic Novel that depicts Staff Sergeant Avery Johnson's escape from the Flood Containment Facility on Installation 04. It is illustrated by Tsutomu Nihei and is fourteen pages long. Sergeant Johnson opens fire on the Flood. Following contact with the Flood, Sergeant Johnson manages to avoid being overwhelmed by Pod infectors. He fires at a Pod infector which has latched onto Private Jenkins, though he fails to kill it. He watches as the Marine transforms before his eyes into a combat form. The combat form delivers a blow to Johnson's arm, throwing the sergeant out of the containment room, across a large observation chamber, and into a wall. Several infected Marines approach Johnson, prompting him to run into a hallway. He locks the door with a spoofer and proceeds down the hallway. An infected Marine fires a shotgun at Johnson. The pellets hit the wall, missing the sergeant by inches. 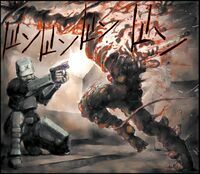 Johnsnon dives to the ground, firing the remaining rounds in his assault rifle into the combat form, ripping its head off but not killing it. He then shoots down the combat form with his pistol. He makes his way across an energy bridge, jumping onto the other side just as a combat form shuts the bridge down. As he jumps across the chasm, he throws a grenade behind him. The explosion kills his pursuers, knocking him to the ground. He steps onto the lift, glad to have finally escaped the Flood. There are several discrepancies in the story. For example, instead of bleeding yellowish fluid (as commonly seen in the games), the combat forms bleed red fluids, and the number of pellets coming out of the barrel of the shotgun is greatly exaggerated. Additionally, at the beginning of the story, Johnson and his teammates appear to be in a different place inside the containment facility from the one seen in the level 343 Guilty Spark. In the story, the Pod infectors are able to infect the Marines in mere seconds. This behavior was not seen in-game until Halo 3.